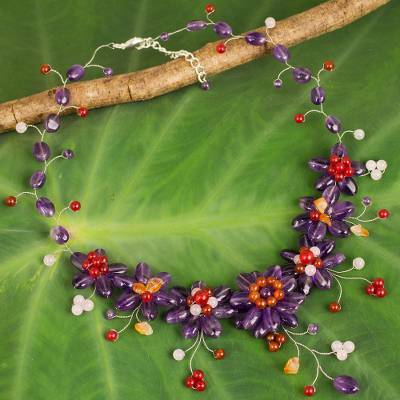 Handcrafted Thai Floral Waterfall Necklace with Gemstones, "Purple Zinnias"
Luminous gemstones become beautiful flowers that blossom in a handcrafted necklace by Sasina. Amethyst zinnias find a complement in rose quartz, carnelian and quartz. With their graceful tendrils and colorful buds, the lovely flowers form an elegant cascade of color. You can find multi-gemstone waterfall necklace 'Purple Zinnias' by Sasina in jewelry categories such as Floral Necklaces, Birthstone Necklaces, Multigem Necklaces, Rose Quartz Necklaces, Quartz Necklaces, Carnelian Necklaces, Amethyst Necklaces, Silver Plated Necklaces, Stainless Steel Necklaces, Brass Necklaces and Waterfall Necklaces. Enjoy exploring these sections for other Novica treasures. "This will be in my jewelry collection forever." Exquisite necklace. The flowers are so life like. Beautiful colors. Workmanship is wonderful. This will not be my last one.